In April, when the air was crisp and cool and full of promise, a pair of bright-eyed young farmers declared this blog would receive timely updates all season long. Alright, let’s rewind to Memorial Day weekend, when a new face arrived at the farm, and hundreds of feet of tomatoes and peppers went in the ground. The new face was Angelica. Just a few days earlier, the Bolivia native graduated from Edinboro University with her environmental studies degree. She made Plot Twist Farm history as its first part-time employee. Angelica joined the farm in 2018. We’re happy to report she’ll be back in 2019. On the business side of the farm, an employee meant a whole new set of laws to learn. For the first time ever, we experienced what it felt like to have someone else’s paycheck be our responsibility. While this was stressful at times, we met our payroll obligations, and we realized how much more can be done with just the addition of one smart, hard working person. Adding a helper meant we could expand the CSA to 60 households, and we could add another farmers market. The market we chose was the Market House, in Meadville, on Saturday. This was Angelica’s territory, while I returned to the Titusville Open Air Market on Tuesday and Saturday. This was year two for us at the Titusville market (now located on Route 8). When people ask us, “How did the garden do this year?” The simple answer is, “Good.” Overall, we were happy with the crops and variety. Shortcomings were usually because we ran out of time to do something. (Tomato trellising just didn’t happen again this year. It was still a beautiful tomato harvest, but it’s going to be even better next year.) The insect problem persists, namely cucumber and squash bugs. We’ll be enlisting the help of feathered friends with that matter in 2019. Our efforts to discourage cucumber beetles (screening in a high tunnel, planting tomatillos as a diversion plant, and sprinkling Diatomaceous Earth) paid off somewhat. We carted out about 400 cucumbers per week for several weeks in the beginning of the season. Eventually, the beetles did their dirty work, but we still considered this crop a success. Our screened high tunnel helped keep the cucumber beetles at bay for awhile. 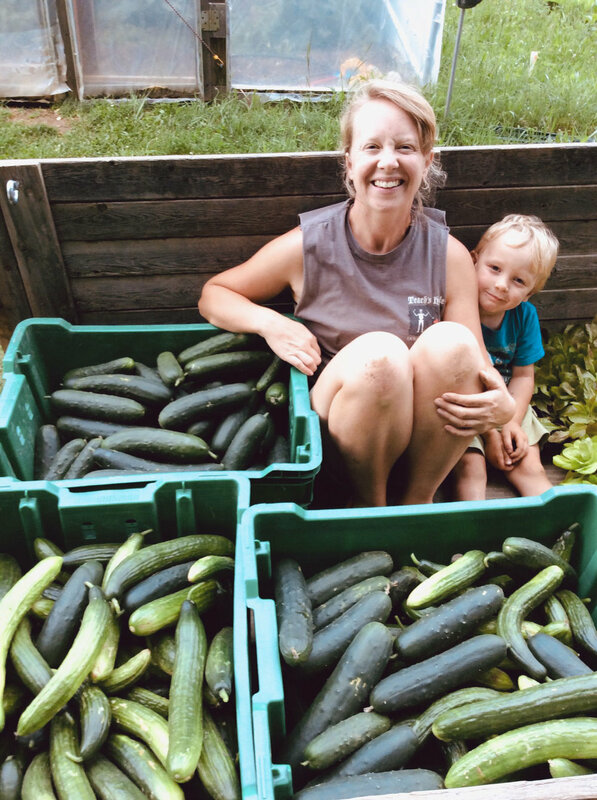 We harvested about 400 cucumbers per week for several weeks in the beginning of the farm season. One disappointment this year was peppers. In 2017, we had a fantastic pepper year, with just a few rows in a high tunnel. This year, we went big on peppers, and they ended up overtaken by weeds. By the time we tamed the whole mess, it was too late. We know we need to “weed” (hoe) all rows before the weeds are even visible, it’s just a matter of time and human power. Remember that scene in Indiana Jones when he’s scrambling away from the big rolling boulder? And when he escapes the boulder he finds himself staring into the arrows of angry natives? Well, that was how this year felt for us financially. The $5,000 in anticipated bills included our approximately $3,000 annual Farm Service Agency loan payment. In 2017, we borrowed money from the government to purchase our walking tractor and its implements, and two high tunnels. It’s a low-interest, seven-year loan. No regrets about that decision. We could never have afforded the walking tractor without it. And without a walking tractor, we never could have expanded our farm. The remaining $2,000 in payments was what we decided to contribute to a grant for a new high tunnel we received from the Natural Resources Conservation Service. The grant was for $7,000. 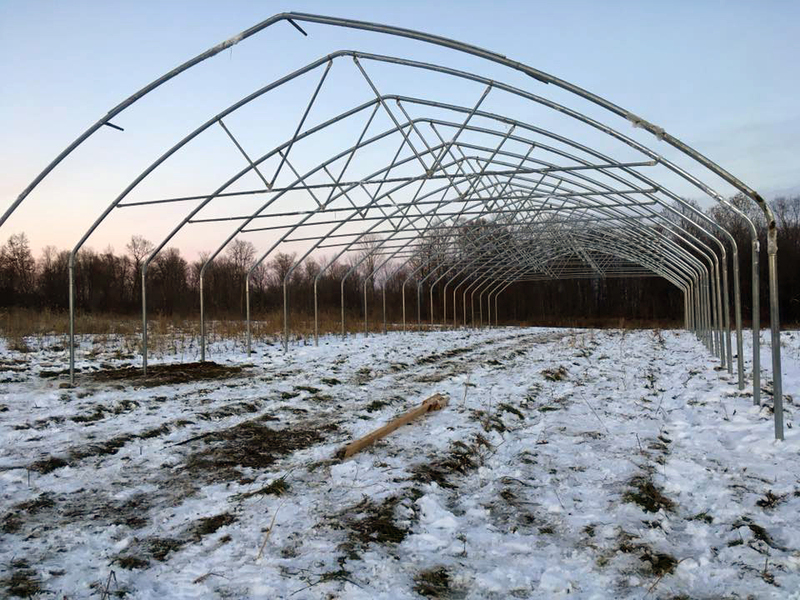 We knew this was probably our only chance to get a big high tunnel, so we decided to kick in our own money and purchase a 95- by 30-foot structure. 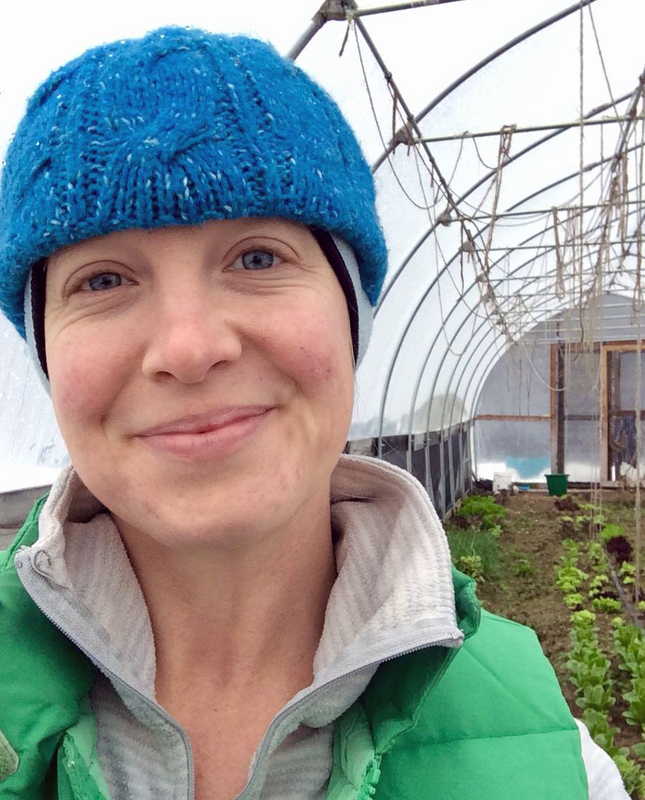 The grant was also a reimbursement grant, which meant we had to pay for the high tunnel out of our own pocket, and then be reimbursed the government’s $7,000 portion. In the end, we pooled together the money we needed with personal income, farm revenue, a temporary, zero-interest credit card, and a few financial events that ended up being sheer luck. Would you take this year’s farm season and turn it into a PowerPoint presentation on how to manage a farm budget? Uh, no. But we made it through and learned our lessons. We’re working on season five’s budget now. With Angelica returning next year, we solidified a big chunk of her payroll in CSA share payments. When the season starts in June, her cash will be sitting in an account already. No more mid-season fear when a market stand isn’t performing the way we’d hoped. Alright, enough whining. Things got scary. Wah wah. Time to wipe away those tears with a big kale leaf and get to the good stuff. Having a part-time helper unlocked so much farm potential. So much so that next year Angelica will be full time for the majority of the season. On the farm, the beginning of the week was the same as the previous season, with me working on the farm as much as possible during the day, and Jason joining me in the evening. Silas turned 4 last summer, so he spent a lot of time in the gardens with us, but, thankfully, we still have grandparents to rely on for child care. In the second half of the week, we had Angelica’s help. Thursday and Friday were the big harvest days, and Saturday was delivery and farmers market day. The biggest, best change this year was that having an extra set of hands on the farm took out the sheer exhaustion factor of the season. In season one, Jay did everything. We only had eight members in the CSA, but we did have a new baby. During season two, we sold our house and moved the farm to a brand new location. This is known as The Season from Hell, and the thought of it still makes Jason scratch the scars he got from a stress-induced case of shingles. Season three was a whole new world. I quit my full-time job to take over farm management, and having me on the farm so much more showed us the possibilities that lay ahead. However, the season was still drag-yourself-into-bed-with-dirt-caked-all-over-your-body exhausting. In 2018, season four, with me full time, Silas a bit older, Jason on the farm weekends and evenings, Angelica part time, and some extra help one day a week, things got … pleasantly tiring. No more packing boxes until midnight. Boxes were typically ready to go by early afternoon, or sometimes even in the morning, which left plenty of time to harvest for the farmers markets. In my first season full time on the farm, the share boxes went alright, but it still felt like 18 weeks on a runaway train. What would be in next week’s box? Will there be enough of this? Will there be any of that? What actual edible recipe can we put together in the newsletter with this hodge-podge? This season, the share box newsletter went from being a 1 a.m. Friday chore, to a relaxed task that I could start on Wednesday or Thursday because I knew what would be in the week’s box. Also, rather than staring at what we gathered on Friday, and then frantically trying to find a newsletter recipe to fit the box, I found myself studying recipes first, and then assembling the ingredients list. Kind of like going grocery shopping on our own farm. Another step we took this year was to include herbs in most boxes. While this wasn’t our first year growing herbs, it was our first year having any time to harvest them. Picking 60 bunches of parsley alone takes a good chunk of a day, but with Angelica and our Friday helpers, time could be found. Cooking with fresh herbs is a lot of fun, and we were proud to provide that experience for CSA members. The clock started ticking on our high tunnel grant in early 2018. We had a whole year to get the frame up, but, as you know, a year goes fast. Our choice was whether to do it in early spring, or late fall. The middle chunk of the season was too hectic. Well, as it turned out, early spring wasn’t exactly a time of leisure, plus we were hoping to raise money to cover the high tunnel cost, rather than charge it, and wait for our reimbursement. So, fall it would be. The high tunnel builder was holding off sending our shipment, in the hopes he could sell a few more tunnels, and all of the farmers could split the shipping cost. But, we were closing in on Thanksgiving weekend and getting nervous that the weather could turn any day. The high tunnel moved with amazing speed from Missouri to Erie, and then languished a week for reasons we’ll never know. When the semi finally arrived, the driver had the best of intentions, but accidentally sunk his right tires into a deep, muddy ditch in front of our house, raising the rig in the air. There were a few hours when the trucking company was saying that when the semi was out of the ditch, it was moving along with our high tunnel still aboard. No! No! No! How would we ever get 4,000 pounds of high tunnel back to Dingman Road? Most importantly, we’d lose invaluable time and good weather. Thankfully, our neighbor was able to pull the rig out, and the trucking company agreed to let us unload. With the high tunnel bundles safely up at the farm, we could let out a little of the breath we’d been holding in all year. Grandpa Gary and his tractor, and several friends helped with our big high tunnel project in December. Jason with one of many big, stupid rocks we dug out of the earth before setting the high tunnel poles. Every decent day in December that Jason had off from his day job, we worked on the tunnel. We had help from Grandpa Gary and his tractor, and from friends, and childcare from family and friends. The weather was sometimes cold, always muddy, but overall, fairly mild. Holes were dug. Poles set. Clamps tightened. Piece by metal piece, it went up. With help from a federal grant, we put up a 95- by 30-foot high tunnel in December. On the evening the last hoop went up, a beautiful sunset surrounded the farm. I had a few minutes alone, so I poured a cup of coffee and experienced two blissful events: my hands were finally warm, and the biggest worry of the farm season, was released. Jason – This winter, Jason is back at it again with his Excel spreadsheets. Over the years, we’ve learned that you sure can’t plan for everything, but you’d better try. We’re always excited about the new plans he cooks up, but never more so than this season. You see, we’ve got that great big high tunnel now, and the possibilities are endless. In late fall, Jason took a full day to stock our small high tunnel with lettuce heads, kale, Swiss chard, and green onions. Thanks to his work, we’re still harvesting from that tunnel and selling to a local shop in Oil City each week. Jason’s spending his winter finishing up work on the new high tunnel, enjoying time with Silas, and working on art projects, particularly ink drawings. He’s also taking an online lettuce growing class this winter. Silas – Little man was caught somewhere between being a toddler and a true big boy this year. It’s a complicated, trying, wonderful stage, and we’re not wishing it away too quickly. There were times when he was an actual helper on the farm, gathering tomatoes in the greenhouse and playing independently when work needed to be done. He talks all the time now and has a sense of humor. Silas has a best friend now, a little boy almost his age who we met thanks to the CSA. Watching him play with this new pal is like watching him cross a bridge to Little Boy World. It’s wonderful and makes me proud, but I’m also acutely aware that I’m left standing on the shore. Angelica – She’s currently living on an island off the coast of Venezuela. She’s spending time with her mother and working. We get regular updates from her, and we’ll be sending her farm data soon, at her request, to help her gear up for the season. Me – This winter, I’m enjoying being with Silas, writing a new script, coming up with my own recipes to share in next season’s newsletters, committing to eliminating as much garbage waste as possible, brewing kombucha, heating the house almost solely with wood, and, unexpectedly, reading about money and the basics of the stock market. The stock market and farming having something in common, I’ve learned. It’s all about the long game. Happy New Year, friends. See you in 2019. That’s me, harvesting lettuce heads in the little high tunnel this winter. Newer PostColor & Crunch - Peek Into 2019's CSA Boxes!